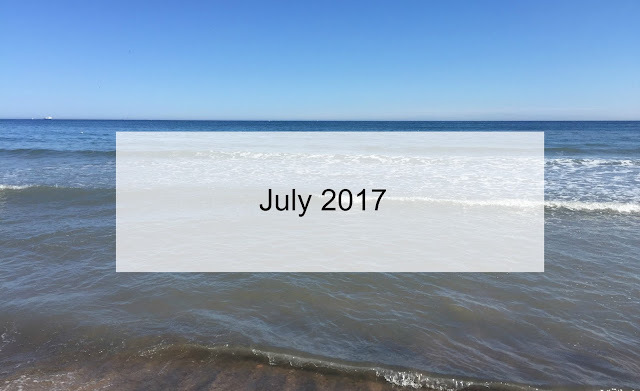 It is almost the end of August but I realised that I have not written my monthly update on the month gone by, I may be super late in writing about July - but better late than never and all that. It feels like forever since I wrote about what I got up to in June. July was a funny month, it was full of highs and lows and lots of time at home, as the new house has been gobbling up all of our money at the moment (again). We have been in our house for about 9 months now and we still have so much to do, we need to redecorate the kitchen, bathroom and toilet, lounge, hallway and children's bedrooms. The list of things we have to do is never-ending, getting professionals in is so expensive so we have been doing a lot of DIY, which I will be honest and say is not our strong point. As we have never really done much DIY before we really need to invest in some proper safety wear and overalls from Engelbert Strauss workwear as the other half spilt a full tin of magnolia paint down himself the other week whilst looking for something in the shed. He was not impressed as he ruined his jeans, top and new trainers. That was disaster number one. Disaster number two was that our fridge freezer broke and we only realised when we went to put our weekly shop away and realised the freezer had defrosted, meaning we had to throw all of our shopping away and replace the fridge freezer, which was rather expensive. We have also had a few rather unexpected bills to pay lately too which has resulted in not many family days out recently, although we have been visiting the beach a lot. July was not all bad though as we have booked a wedding venue at a lovely country house not far from where we live, luckily my dad paid the venue hire for us. We have been planning what kind of a big day we want which is all rather exciting, I am thinking of going for a simple, yet elegant theme with lots of cream colours and have been scouring sites like Confetti for inspiration. The little two children graduated from nursery school and pre-school in July too, it was so sweet watching them graduate. It has been wonderful having all three children off for the summer, I love spending time with them and not having to rush and be governed by the routine of school. Things have been going ok blog wise and I have decided that come September, when both children will be at school and nursery I am going to try and make more of this blog. I have decided that it is time I started treating it like a business and see if I can make a go of blogging for a living. I am going to be posting more regularly and I am also planning on blogging about my upcoming wedding and maybe even setting up a new blog in the future too. I will, of course, be blogging about my future home renovation projects too as it is pretty much taking up all of our spare time at the moment and I am really getting into interiors as a result. So that is pretty much what July was like for us, how was your July?